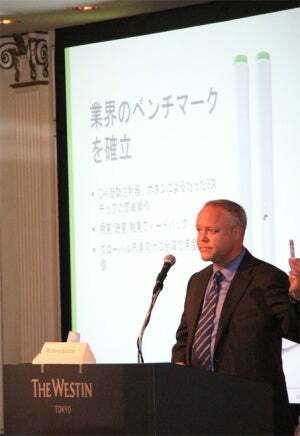 SHL spoke and exhibited at the Japan PDA’s Prefilled Syringe Seminar in Tokyo from 22 until 23 May 2012 and received excellent feedback from many of the conference attendees. Although this was the first time the Japanese PDA chapter held the event, more than 200 people attended and many interesting topics were discussed. Various respected speakers were also invited and presented to the audience new insights into the business and related businesses of prefilled syringes. As one of the few speakers to present on the topic of auto injectors (which often contain a pre-filled syringe), SHL’s marketing director focused on the topic ‘Auto Injectors: Supporting the Biotech Revolution’. This talk gathered a lot of interest from the attendees, especially since auto injectors are still a relatively new concept for a number of companies in the Japanese biopharmaceutical industry. More importantly, with a growing elderly population and increased economic pressure on its healthcare system, Japan may be ideally positioned to further support patients by using self-administration devices such as auto injectors and pen injectors. Commenting on this event, SHL marketing director Steven Kaufman said: "The turnout for this event was extraordinary and it really reflected how diligent the biopharmaceutical companies are in Japan when it comes to exchanging knowledge and keeping up to date with the latest injection technologies. I truly respect the efforts of the PDA organisation, both in Japan and globally, bringing together government, sponsors and businesses to share experiences and knowledge. Great questions were asked by many individuals at our booth, which led to more in-depth conversations even after the event finished. This was SHL’s first time to exhibit in Japan, but we had such a great experience and learned so much more about the needs of the Japanese biopharmaceutical industry that we’ll definitely come back again. " SHL already works with a number of Japan’s leading pharmaceutical companies and their partners to develop auto injectors and pen injectors suitable for the local and global market. However, it is crucial to stay up to date with the regulatory environment of the Japanese market, especially when it comes to developing and launching a combination product (drug and device) like the auto injector. To ensure that SHL continues to stay current with key trends of the Japanese pharmaceutical market, SHL will continue to actively engage Japanese pharmaceutical professionals at events such as this.